Capstone EasyWeb Review 2019: Is Capstone EasyWeb a Good Hosting? Capstone EasyWeb allows you to choose from five globally located data centers in a cloud-based network. The company's feature-rich hosting will appeal to casual users and developers alike, and you can expect great email and phone support. Capstone EasyWeb is a cloud hosting company with plenty of experience, having been around since 2003. It provides a custom-built cloud hosting platform for you to launch and manage a range of different hosting applications. Notably, Capstone EasyWeb has a number of globally-positioned data centers for you to choose from, as well as 24/7 technical support and a 99.9% uptime guarantee. Capstone EasyWeb’s main selling point is that it offers beginners access to a cloud hosting platform with loads of features. True to its name, the company offers all-inclusive plans with loads of value-added features. Although a 99.9% uptime guarantee is nothing spectacular, it’s still impressive coming from a smaller hosting service. That said, one downside of Capstone EasyWeb is that it oversells its scalability somewhat: the amount of storage and bandwidth the company offers might be enough for business customers with smaller websites, but not all. You’re capped at 15GB storage for the highest-tier “E-commerce Business” plan, so if you’ve got a large e-commerce website, you may need to look elsewhere. Other than that, the company provides remarkably feature-rich hosting that’s supported by a powerful, user-friendly custom control panel. 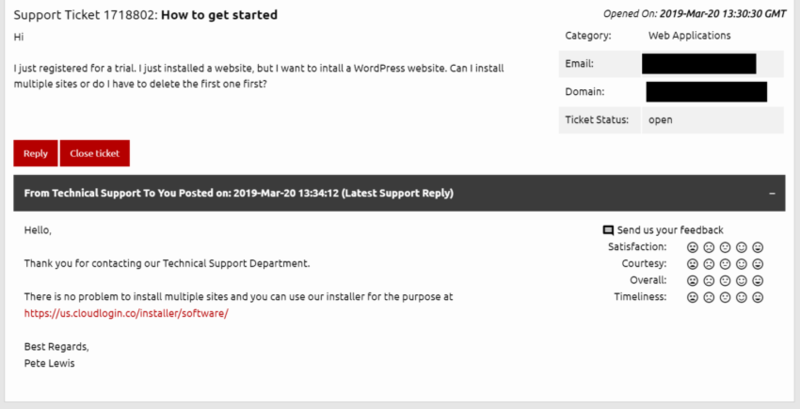 You can use a website builder template to set up your website in three simple steps, or use the one-click app installer to install a number of other hosting apps like WordPress or Magento. On top of that, there are a few unique features, like the SSL certificate generator that can create an SSL certificate for your website. It’ll also automatically install any SSL certificate that you buy through Capstone EasyWeb. You also get pretty decent hardware with RAID SSD storage and the ZFS file system. SSH, Telnet access, cron jobs, and all the developer features you’d expect are also well covered. When it comes to hosting plans, it doesn’t get much simpler than at Capstone EasyWeb. The company features four different cloud hosting packages, each named according to the type of website it’s suitable for: Basic Business, Standard Business, Full Business, and E-commerce Business. Although the prices here aren’t too far behind other U.K.-based hosts, Capstone EasyWeb’s hosting is just a tiny bit more expensive than what you’d expect, especially considering the low storage limits. You also have no excuse not to at least try out its services, as the company generously offers both a 30-day free trial period as well as a 30-day money-back guarantee. All of Capstone EasyWeb’s plans mostly come with the same features, except for the Basic plan (which is extremely limited). You’ll get a free domain from the Standard plan onwards. However, there aren’t any free SSL certificates aside from the ones created by the SSL generator (which may not be as secure). The company also only offers annual billing terms with no month-to-month options. However, you should have ample time to try out its plans before you fully commit. There’s also an excellent knowledge base that covers all the most important topics with a few step-by-step and video tutorials. If you want the ability to host a number of different websites and applications in the cloud, then Capstone EasyWeb is a superb option. Although you can find cheaper hosting out there, you might struggle to find hosting that is as feature-rich. Feature-rich Cloud Hosting with Capstone EasyWeb! Wondering how Capstone EasyWeb stacks up against other Web Hosting companies? Enter any other Web Hosting company and we will give you a side-by-side comparison.